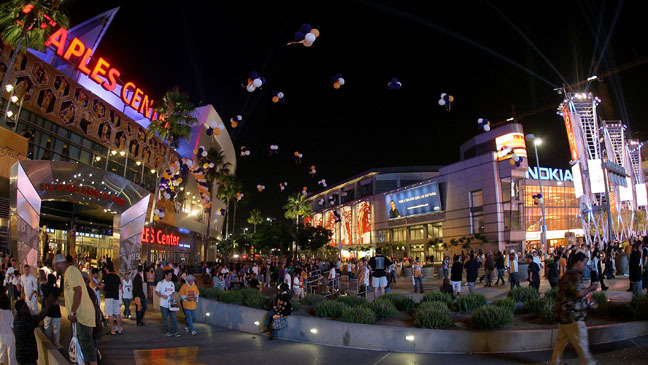 L.A. Live is the entertainment complex for Los Angeles. Located downtown, at the Staples Center sports and entertainment stadium (home to the LA Lakers and LA Kings sports teams, and on the metro rail and MTA bus routes as well as being located at crossroads of 4 major freeways. L.A. Live has over 5,600,000 square feet (520,257 square meters) of event spaces, ballrooms, bars, concert theaters, restaurants, multiple high rise hotels, as well as the 14 screen Regal Cinemas west coast flagship movie theater complex, home to the Los Angeles Film Festival (LAFF) and the Hollywood Reel Independent Film Festival. HRIFF is the last major Los Angeles Film Festival to screen movies during the final Oscar© voting period and is held around the Academy Awards© event and press season. The LA Live center hosts: Staples Center sports arena, The Grammy Museum, The Nokia Plaza concert hall, Club Nokia bar and dance club, and the ESPN braodcast offices. With over twenty on site restaurants, including Katsuya, Lawry's Steakhouse, Starbucks, Smashburger, The Yard House, The Farm of Beverly Hills, Lucky Strike Lanes bowl & dine, as well as two Wolfgang Puck restaurants. Relax at LA Live hotels including the 879 room JW Marriott hotel, the Residence Inn, or the world famous Ritz-Carlton hotel and spa, all located in the LA LIVE complex. Or visit the Courtyard by Marriott hotel tower directly across the street from the Regal Cinema 14 Movie Theater Complex, home to HRIFF Awards Ceremony and Best Picture event screenings. HRIFF ticketing check in for Regal Cinemas occurs in LA LIVE in our own HRIFF Film Festival Box Office that is separate, but nearby the Regal Cinema Box Office. Regal Cinemas Box Office does not handle film festival screening ticketing. You will need to go to the HRIFF LA LIVE Box Office or Pre Order your tickets online. Those with tickets can check in at the HRIFF Hospitality Desk inside the Regal Cinemas lobby. Credit and Debit cards ONLY are accepted at the Main HRIFF Box Office at LA LIVE (the HRIFF BOX OFFICE / Georgia St). Note that on festival days the HRIFF Box Office ticketing lines can be quite long, and pre-ordering HRIFF tickets online with print out is recommended for more a convenient check in at the HRIFF Hospitality Desk in the Regal Cinemas lobby (skipping the Box Office portion of check in and speeding up your entry to the film of your choice). Always check the current HRIFF Program Guide to find out which of our many venues is screening the film of your choice, and read all ticketing guidelines for each venue. Located at Regal Cinemas at LA LIVE, The HRIFF Main Box Office / Georgia Street ticketing window is located to the left of the Georgia Street entrance doors at Regal Cinemas. Regal Cinemas own Main Ticket Windows (for Non-Festival Ticketing) are located at the corner of Georgia and Olympic. Directly to the left of those Regal Ticketing Windows is the Georgia St. entrance doors to Regal Cinemas. Directly to the left of those doors is our HRIFF MAIN BOX OFFICE / Georgia Street ticket window. This is the main box office for HRIFF Film Festival ticketing, will call, and messenger drop off. HRIFF MAIN BOX OFFICE accepts Credit /Debit Cards ONLY. RIFF MAIN BOX OFFICE / Georgia Street is open during the festival screening days. Opens 15 minutes prior to the start time of the first film screening of day, and closes 30 minutes after the start of the last film of the night. *For cash purchases a limited-time HRIFF Box Office located in G1- West parking structure will be open for 1 hour at the beginning of festival screening days (opening for 60 minutes prior to the starting time of first screening of each day and closing before the first screening starts).